In the Women's Writing Circle we explore many writing styles and share our stories through a variety of genres. If there's one thing we have in common, it's how writing offers an exploration of those things that most capture our imaginations, our pain, our joys, our self-discoveries and the human condition. I'm twenty-six years old and I've been writing for as long as I can remember. I've always loved fantasy stories. So, I guess it's no surprise that I write mostly fantasy fiction. As a writer of fantasy, one thing I often hear is, "I don't usually read fantasy so I don't know much about it." So, what is fantasy fiction? There are many types and sub-genres of fantasy, but the basic definition: Fiction that contains magic and supernatural elements as a main point of the story. Stories often take place in worlds created by the author. Magical beings and fantastic creatures such as unicorns, dragons, and many others, are not only possible, they are a part of life. Fantasy novels offer a broad range of characters and settings and stories to tell. Characters can be men or women, they can be adults or teenagers or even children. There are fantasy novels written for people of all ages by people of all ages. Characters can be any race from human beings like you and me, to vampires and werewolves, to fairies or mermaids, or even dragons. Or people who turn into dragons. Or dragons who turn into people! It's just so much fun to think about what life would be like if I could actually go into one of these magical worlds. Wouldn't it be fun to be able to fly? Or see a unicorn? Or use magic? I can imagine visiting another world and experiencing these things. I love writing fantasy because I can create another world and fill it with characters who, in my place, can experience these things for me. 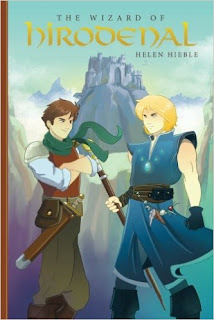 Stories can take place in a fantasized version of the European Middle Ages, such as in the The Mists of Avalon by Marion Zimmer Bradley. Or a stylized version of the Oriental feudal era in Alison Goodman's Eon and Eona. They might be set in a real town in the real world in the past, or modern day. One example of a fantasy series in this setting is the Twilight Saga by Stephenie Meyer. They might also take place in a fictionalized town set in the modern day, real world like the town of Mystic Falls, Virginia in L.J. Smith's young adult series The Vampire Diaries . . . or in a world created by the author in J.R.R. Tolkien's Lord of the Rings trilogy or Terry Goodkind's The Sword of Truth series. And sometimes in multiple worlds as in the Harry Potter series by J.K. Rowling or in Frewin Jones', The Faerie Path. Another question I'm asked, "Why do you like fantasy so much?" I haven't always had a clear understanding of why. As a child, I never put much (or any) thought into why I liked something. I just liked it. But as I grew older, I began to identify with the characters. And while I knew that many of the things my favorite characters went through were things that I would never have to deal with exactly - such as fighting and defeating monsters - I also knew I would deal with difficulties in my life. The heroes and heroines of my favorite stories, despite the many hardships, trials and tribulations always find a way to persevere in the end, usually with the help of friends, family and teammates. The characters in the books I read as a teenager and the books I still read today, inspire me and give me hope for the future. They help me to believe that things will always work out and that with hard work and the help of your allies, you can do anything. Please join in the conversation and share your thoughts and questions with Helen about fantasy fiction or how stories spur imagination and offer insight into our own life journeys. Helen Hieble lives in Wayne Pennsylvania. She has been writing short stories in the fantasy genre for over ten years and has self-published one fantasy-romance novella, The Wizard of Hirodenal. She has also written a journal, My Favorite Things: A Journal to Record Your Favorites, From Anime to Video Games. Helen runs a copyediting and writing service: www.writefromtheheartservices.com. Her author website is www.thewizardofhirodenal.com. In her free time when she is not writing, Helen enjoys listening to music, playing video games, and watching anime. She is currently working on her next novella.